Grand Banks demo boat in Malaysia. 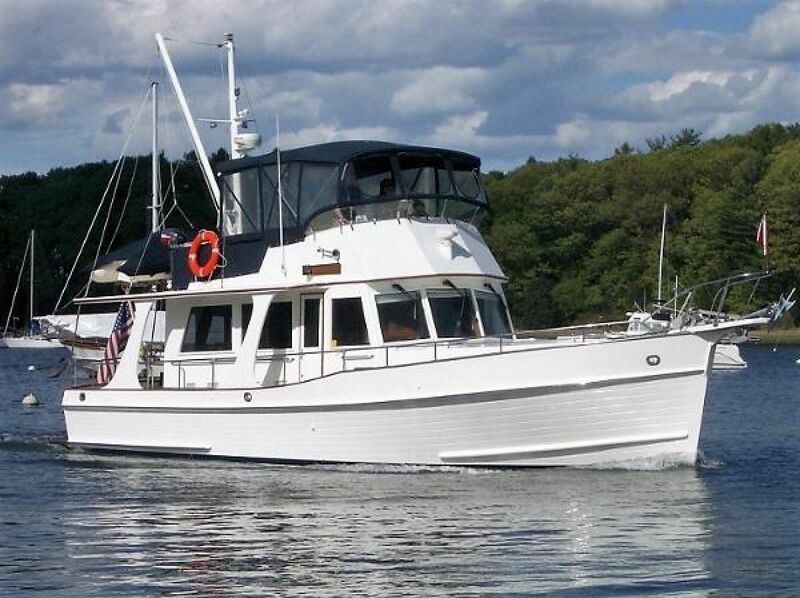 She was outfitted and used by Grand Banks executives as a result, special care was put into her outfitting and new things such as teak crown molding, glass inserts for sliding saloon doors were added to this boat before the rest of the Grand Banks lines. She was purchased and brought stateside by a former US Expatriate in Singapore. She's completed the great circle loop and has attended numerous Grand Banks Rendezvous along the East Coast. Currently owned by a couple who have functionally enhanced her and upgraded her inventory to today's standards. They have cruised her up and down the east coast and have kept her in tip top condition. Life changes have led to their offering Christi Anne for sale. 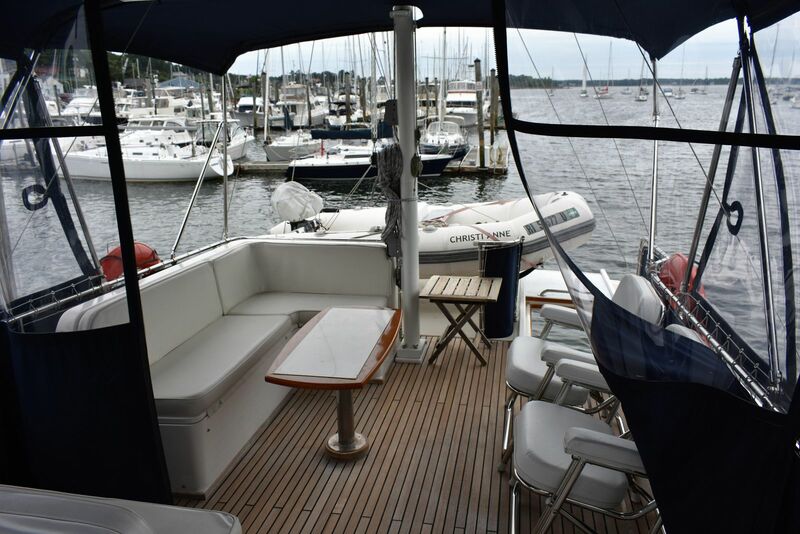 This is the popular Europa model that offers covered aft and side decks. 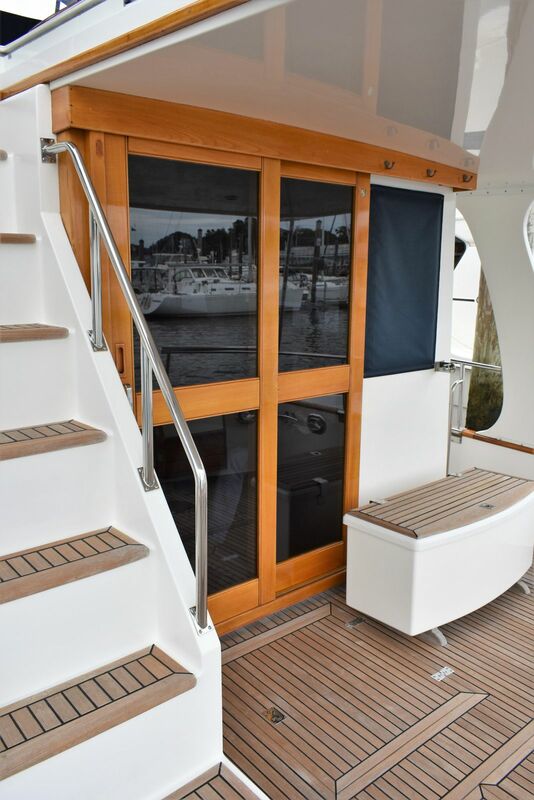 You enter the boat through sliding teak doors with clear glass inserts, to saloon. A large curved settee is on port with two swivel barrel chairs flanking an entertainment center cabinet. A bar cabinet with ice-maker is forward of the barrel chairs on starboard. 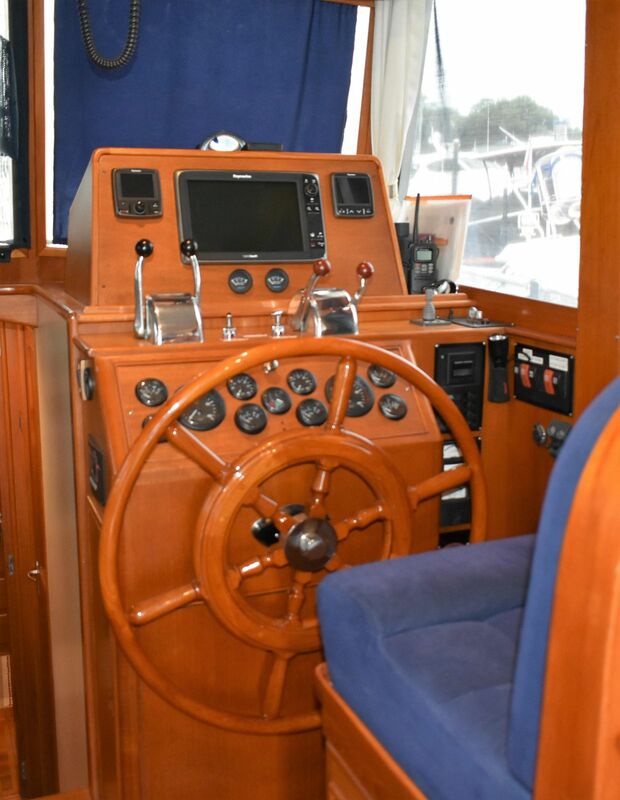 A sliding helm seat is aft of the lower helm. 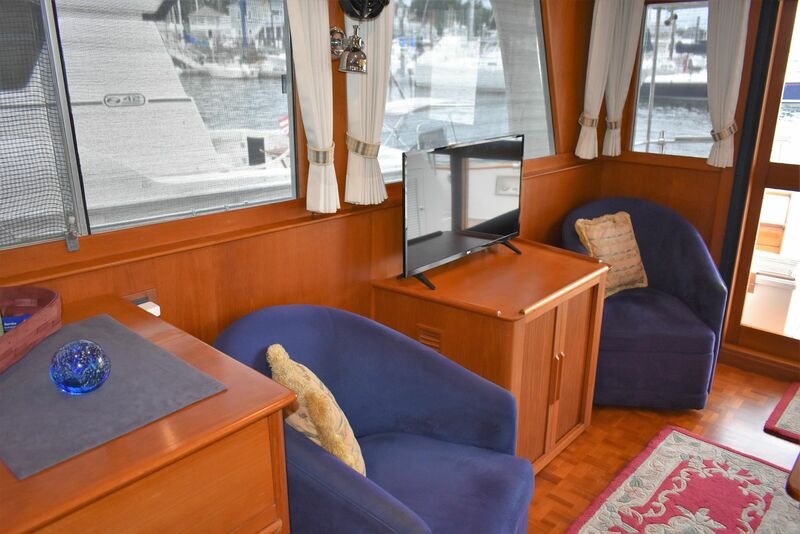 The L-shaped galley is on port and offers a corner reach-in ice box and a large under counter refrigerator. The ice box has 4 inch foam insulation - 6 cubic feet of storage. A built-in microwave is in the overhead cabinet. Drop down dish lockers are over the Corian single sink. 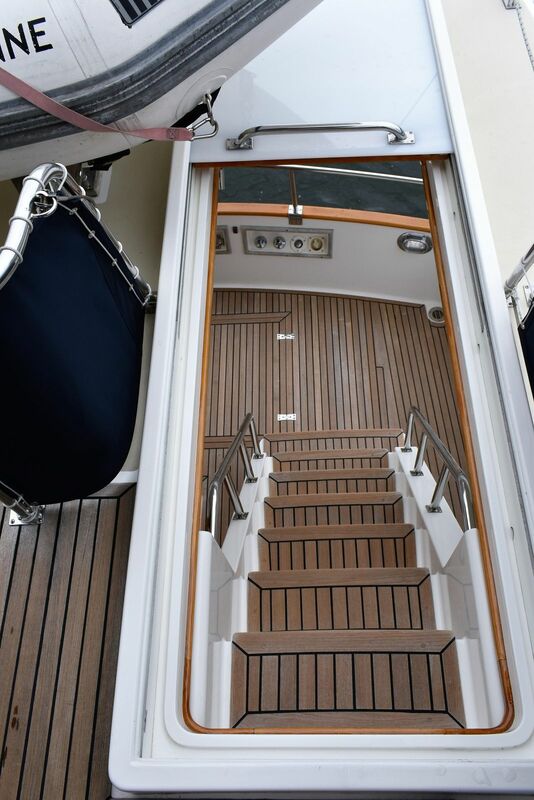 Down three steps a companionway leads to the port guest cabin with one fore and aft bunk and one athwartship bunk. There is also a hanging locker and drawer stowage. 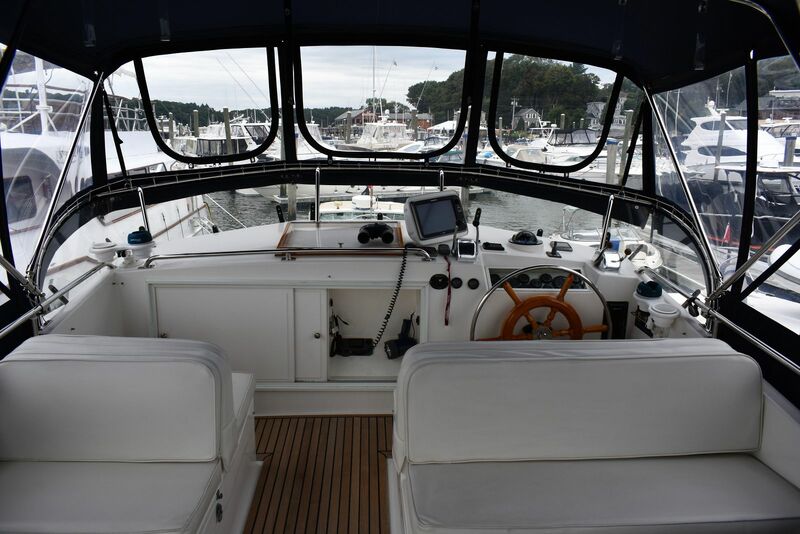 The head is on starboard with a door from the companionway and a door coming in from the forward master cabin. The head has a large separate stall shower. 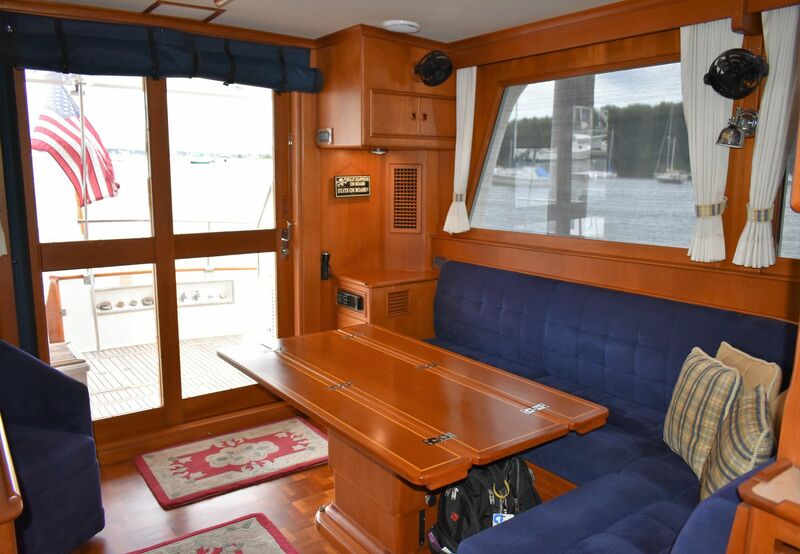 The master cabin is forward and offers an island queen berth, hanging locker and bureau drawer stowage. Teak cabinetry and teak parquet soles throughout. Custom drapes and tie backs. All cabinet door hinges have spring open and close. 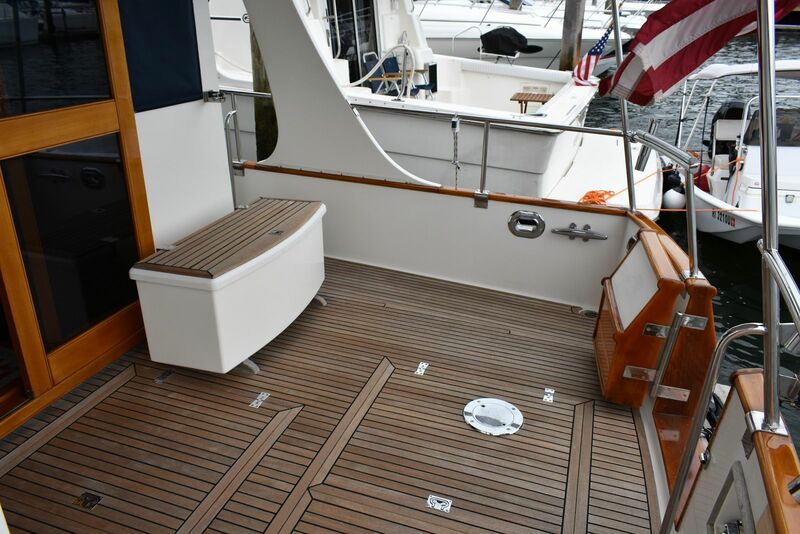 Teak crown molding throughout boat. All cabin windows have a light tint. Tool chest with spare light bulbs, stainless screws, clamps, etc.